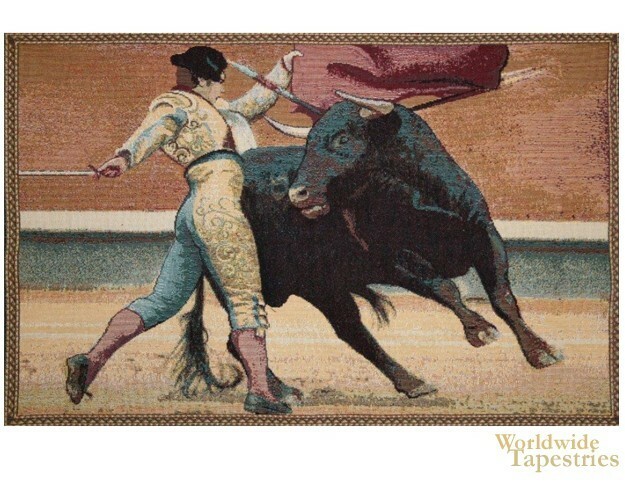 This Bullfighter Torero wall tapestry shows a bullfighter and bull in action. Here we see the Spanish sport which originated from a cultural event. Here we see a toreros, a bullfighter, whose style reflects the countries or regions from which they originate. The interest in this sport includes the artistry, the ritualism from its ancient past, and the display of bravery and command. This art tapestry is backed with a lining and a tunnel for easy hanging. Note: tapestry rods and tassels, where pictured, are not included in the price. Dimensions: W 9" x H 12"